I like to think of King David as a warrior. He’s the guy that entire armies were afraid of. When he stepped on to the battlefield, it gave his army the psychological advantage. It boosted his army’s confidence and crushed that of his enemy. But that’s not the complete picture of who David was. When you read the Psalms, you see a guy who was worried and afraid at times. You see the thoughts of that brave warrior written down in black and white saying he was terrified at times. No one can be brave and strong all the time. No one is impervious to the words that others hurl at us. After a while, they get to us. They penetrate deep into our mind and heart. They start to cause doubt. They can cause paranoia to. That’s where David was in Psalm 31. He said, “I’m in deep, deep trouble again. I’ve cried my eyes out; I feel hollow inside… My troubles have worn me out.” Even the great warrior David had days where he felt insecure and alone. Every time the thoughts of insecurity came into his mind, he went back to God. When fear crept in, he called out to God. “Hour by hour,” he said. It wasn’t a daily thing. It was an hourly thing. He knew not to let those thoughts linger in his mind. They’re destructive and counterproductive. They are thoughts meant to pull you away from who you are in Christ. Don’t let them rule your mind. When they pop up, run to God like David did. Call out to Him and speak to who He is. When we speak to how great our God is, our problems don’t seem so big anymore. When we call out to Him for help, we win the psychological battle. Just like when David stepped onto the battlefield, God steps into our situation and gives us the victory before there is ever a fight. He is our strong tower. He is our defender. He gives us the victory in our hearts, minds and lives. When the enemy hears us call to Him and sees Him co ing to our defense, they know the battle is over. You know the battle is over. I love how he ends Psalm 31 in verse 24. He says this to you, “Be brave. Be strong. Don’t give up. Expect God to get here soon.” I don’t know of any better words of encouragement than that. When you call out to God, He’ll be on His way to help you. In the mean time, be brave and strong. Don’t give up or let the enemy win the psychological advantage over you before the battle begins. God is on your side today and He’s on His way! In one of the classes I teach, I have people introduce themselves and tell me a hobby they have outside of work. It provides opportunities for connection early in the class as well as information I can tie back to throughout the day. Yesterday, while training this class, a guy answered that he liked to play music. I followed up with, “What kind?” He responded with, “Worship. I’ve felt called to lead worship since I was young, but I’ve been too scared to step out and do it.” He admitted in front of our group what so many of us Christians are afraid to say. God’s call on our life can be scary. I think it’s supposed to be. If it were anything less than scary, we’d do it without hesitation. The problem with that is we would think it was done in our own ability. We need to understand that we are simply vessels to be used by Him. It is He who performs the work, we simply provide the channel. Our inability to do whatever He called us to is His greatest opportunity to do something amazing. God sees in us what we cannot see. Peter was just another uneducated fisherman when Jesus called Him. He didn’t posses the ability to start the Church. He didn’t have the business acumen to take twelve men, start a worldwide movement and grow it. He didn’t have the boldness to stand in front of thousands to preach. He knew what fear was and it got the better of him from time to time. He denied Jesus and his calling in the same night. The fear of his calling to be the rock that the church would be built on caused him to go back to fishing when he should have been preaching after the resurrection. He went back to what he knew instead of stepping out in faith to be the rock he was called to be. Jesus didn’t leave him in that boat though. He went to the waters edge in John 21, but they didn’t recognize Him. He called out to them, “Have you caught any fish?” They replied, “No.” Jesus called out, “Throw your net on the right side of the boat and you’ll catch some.” As soon as they did, the net teemed with fish. Peter recognized the man as Jesus and swam to shore. Jesus reaffirmed to Peter that day what his role was. He didn’t worry about his failures or inabilities. He worried about his love for Him. Jesus knew that if he truly loved Him, he would obey his calling. He didn’t leave Peter in the boat catching the wrong kind of fish. He reiterated that he was to be a fisher of men from now on. I think that call goes out to you in whatever boat you’re sitting in today. Maybe you’re reading this in the place where you can accomplish things in your own strength. It’s the boat of what is familiar and easy to you. But God has more for you. Have you really caught anything where you are? I encourage you today to recognize the fear that is paralyzing you and keeping you from your calling. If God called you to do something, it’s His strength and ability that will accomplish it, not yours. Release the fear that sent you back into the boat of the familiar and do what God has called you to do. Faith is about trusting God to do what He said He would do. It’s not about you doing things and giving Him credit. Don’t let fear hold you back another minute. If you love Him, feed His sheep. This morning started like most mornings. My alarm went off and I hit the snooze button. I did that three times before getting up. I turned on the light and grabbed my phone to read the Bible. As soon as I did, I heard music. I leaned over and checked the clock radio in my hotel room. It was off, but the music was coming from right where it was. The walls in my hotel must be paper thin. The person on the other side of the wall was waking up too. I couldn’t concentrate so I turned my clock radio on too. I put it on the AM dial and turned to where there wasn’t a station so the white noise would drown out the music. It was still hard to concentrate as I read. I managed to get through it and find a verse to think about today. Afterwards, I went on my way to getting ready and started praying. It wasn’t long before I heard an alarm going off. It was my clock radio. I went over, hit the off button and looked or a way to keep it off. I went back across the room to pray. It went off again. I turned it off and returned to praying. As I was praying, I kept hearing all the room doors opening and closing up and down the hall. So distracting. Jesus knew we were going to face distractions when it comes to spending time with Him because He faced distractions. That’s why He went away from the group to pray so often. It wasn’t that He didn’t enjoy their company, it was so He could get some alone time with the Father. He was trying to show the disciples by example how they should be spending time with God corporately and alone. All the Gospels talk about Jesus separating Himself to pray. Jesus even told them in Matthew 6:6, “When you pray, go away by yourself, shut the door behind you, and pray to your Father in private.” Part of that instruction was so that we won’t be like others who pray so others will hear them and the other part was what I’m facing today. It was to get away from the noise of life that tries to distract us from not only spending time with God, but from hearing from Him too. With all the distractions going on this morning, I had a difficult time hearing His voice. I ended up leaving the hotel to get away from all the distractions so I could have alone time with Him. Where are you today? What distractions keep you from spending time with God? Kids? Spouse? Neighbors? Friends? Radio? TV? Your phone? Facebook? Whatever it is, find a place and time today where you can just be alone with God. Spend time talking to Him and also spend some time listening to His voice. Read His Word in the quiet so you can really understand what He is trying to say to you through it. Get away from the noise of this life so you can concentrate on God. I’m not sure why I am constantly surprised by the goodness of God. There are times where I am just caught off guard at His faithfulness. I look at my life and I see all of my short comings and wonder why God would choose to bless me and to pour out His love on me. I know that I am unworthy of any gift that He gives, yet He still opens up the windows of Heaven and pours them out. I think that’s one of the areas where it is hard to understand God because our minds try to rationalize Him as a human with human behaviors. We know the we are spiteful and hold grudges and we expect Him to. When He doesn’t, it blows our mind. I love how the psalmist put it in Psalm 36:5 when he said that His unfailing love is as vast as the heavens and His faithfulness reaches beyond the clouds. It is so deep and so wide that we can’t begin to understand it. I always want to rationalize it and understand it rather than to accept it and abide in it. I want to break it down and figure it out instead of just trusting in it. I think David understood it. He knew of the power that God has to forgive and forget. He relied on it and knew he was in trouble without it. You wonder how can an adulterer and murderer like David be a man after God’s own heart? Well it’s because he understood God’s ability to forgive and to forget. It’s beyond me how God does it. I try to be a man after God’s heart and I fall short. I try to be like Him and I find I’m more like myself. I try to do what He asks and I end up doing what I want. I start off working hard to please Him, but in the end, I do what pleases me. That’s where God’s faithfulness kicks in. II Timothy 2:13 says in the Amplified version that even if we are unfaithful and untrue to Him, He remains true (faithful to His Word and His righteous character), for He cannot deny Himself. How is that possible? How can God remain faithful and true to us when all we seem to do is our own thing rather than His? It’s who God is. He is a God who loves us more than our doubts, our mistakes, our short comings and our fears. He is patient and kind. His love knows no end and is not conditional. He is not human and is not limited like we are. Once we remove those human characteristics of who we think He is and accept His divine nature, we can begin to get a glimpse of who He really is. There were several in the Bible like David and Paul who got a glimpse of that. I don’t think it is reserved just for them though. God wants to open Himself up to you and me and to give us a glimpse of who He is. We fight and push back because we think we are unworthy. It’s when we finally realize how unworthy we really are that He has us right where He wants us to show His faithfulness and love. Don’t push back away from it. Swim in that river of his love that is as high as the clouds and is as vast as the heavens. His love for you doesn’t depend on whether you think you’re worthy. He thinks you are and that’s what matters. As I was praying this morning, I began to think back to my teenage years and my early twenties. I saw places where God corrected my path and even prevented me from making decisions that could have affected the rest of my life. At the time, I didn’t see what was happening or know how close I was to making life altering decisions. 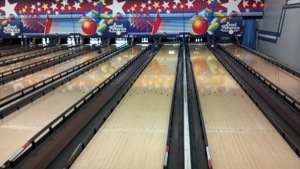 As I began to thank God for helping me to stay on the right path, I saw this image of a bowling ball bouncing between gutter guards. I see now that those guards where there keeping me in the lane. My life hasn’t gone down the center of the lane headed for a perfect strike. Instead, it has bounced from one guard to the other. I’ve gotten course corrections all throughout my life. The further down the lane I go, the less I’m hitting the guards. I’m glad they’re still there though. I know I still need them from time to time. Just like in the game of bowling, the guards don’t always prevent the ball from rolling into the gutter. It happens. It happened. My life did roll down that gutter for a while. I went past the guards that God had in place to keep me in the lane. Thankfully, even in the gutter, God put a course correction for my life. I had the opportunity to bounce out of the gutter and back into where He wanted me. When life rolls into the gutter, it’s easy to forget that you can get back into the lane God has for you. It’s easy to think that you’ve somehow messed up so bad that God can’t fix it. Your mind tells you that you should just stay there and keep rolling all the way to the end. It’s a hopeless place because so very few exit the gutter. But even in the gutter, God is still ready to put us back in right standing with Him. He knows that even when He rescues us from it, our lives will still bounce back and forth. What I have found is that God is patient, kind and forgiving. He never stops loving us even if we go past the guards He set up in our lives. He’s constantly waiting for us to call out to Him for help. He’s looking down that lane to see if we’re ready for a course correction. I think He delights in getting us out of the gutter and putting us back into the lane where He wants us. There’s nothing that you or I could ever do to keep Him from loving us and wanting to put us back where we belong. All we have to do is ask for forgiveness. That has stuck with me this week. We’ve all heard sermon after sermon about praising God in your midnight, but I never heard anyone talk about what he mentioned. We’re so eager to get the chains off that when they do fall off, we run out of the place God had us. We never stop to think that just because we’re free of the chains it doesn’t mean we’re necessarily free from the prison. There may still be work to do there. The guard called for lights and went down into the dungeon where Paul and Silas were, fell on his face before them and asked, “What must I do to be saved?” The quake that night wasn’t about freeing the prisoners, it was about saving a soul. Paul and Silas were in tune with God enough that they knew not to run in their freedom. Instead, they used their freedom in that dungeon to minister to someone who wouldn’t have listened to the Gospel any other way. The guard got his family so they could hear the message. They too were saved. Then he took Paul and Silas into his home, cleaned their wounds and fed them. The next morning they were freed from the jail by the city. Even though the chains that bound them had been released, they were still prisoners until the night was over. Had they fled when the shackles fell off, they would not have been legally free and would have been considered fugitives. The story would have had a different ending. How is your story going to end? We’re all prisoners to something. When we’ve learned to praise in our prison and we’ve been set free, we shouldn’t be so quick to run out of the prison. There may be others who need to be set free as well while you’re there. God can set us free from the things that bind us in order to minister in the place He has us. Where does God have you now? Are you so concerned with getting your chains off that you haven’t noticed others who need your help? Ask God to teach you to open your eyes in the prison you’re in and then start to praise. I work for a company who pays for performance, but serve a God who doesn’t. It’s difficult not to let my work mentality slip into my spiritual life. I try to tie my value to God based on what I do, not on who He created me to be. I think that the more I do for Him, the more He will love me or reward me, but that’s not true. That’s not how God sees me or values me. He loved me sufficiently before I could ever do anything for Him and did what needed to be done for my salvation. I got a glimpse of that when my son was born. Before he was even born, I loved him. Before he could take me by the hand and say, “Come on, Dada. Let’s go play,” I loved him. My love for him is not based on what he does, but on who he is. It’s the same with God. Before we were born or had any knowledge of Him, He loved us deeper than we could ever know. He paid a price for us higher than anyone should have to pay. So why do I tie my value to Him based on my performance? Like I mentioned earlier, I think it has to do with letting my worldly mentality interfere with my spiritual mentality. It’s hard to separate the two. For so much of what I do in life, I’m rewarded based on how much I put into it. There is a value placed on what I do and a monetary reward that supplies needs and wants for my family. The more I do, the more I’m valued. In God’s kingdom, my value is not based on what I do. Ephesians 2:9 says, “Salvation is not a reward for the good things we have done, so none of us can boast about it (NLT).” No matter how much “good” I do, it’s not good enough to pay the price He had to pay for my salvation. I don’t have to do “good things” to get to Heaven. I simply have to receive what He’s already paid for. Because I have received that gift, I now show my appreciation by doing “good things.” The difference is that I have to change my mentality from thinking I’m doing them to earn something He gave to me freely into an expression of love. My performance is not to increase my value to God, but to increase His value in someone else’s life who doesn’t know Him. Once I understand that, the “good things” I do are done out of love and not out of obligation. They are done to give and not to receive. Have you been in that same place where you thought your value to God was based on what you did? Have you let your worldly mentality infect your spiritual mentality? It’s not too late to change course. God values you and loves you more than you can imagine. Even if you feel there is nothing you can do for God, He still places a high value on you. His love for you and your value to Him are not tied to what you have done or will do. He values you simply because you were created by Him. Hold your head high today and don’t let anyone who didn’t create you tell you what you’re worth. God determines your worth based on what He did, not on what you’ve done.